Spicy Cinnamon Taffy: Classic saltwater taffy with a spicy cinnamon kick. 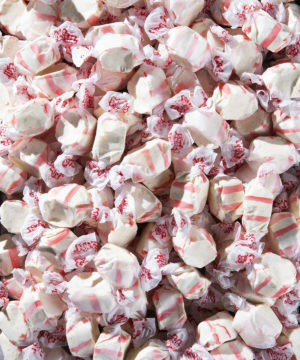 You're probably familiar with the nostalgic and delicious taste of saltwater taffy, but you've probably never had anything quite like Spicy Cinnamon Taffy before. Combining the satisfying stretch of whipped taffy with a big spicy cinnamon taste makes this a treat that tingles your tongue and delights your taste buds. While the spicy sensation outdoes conventional candies like Big Red, this isn't a scary challenge food like the Toe of Satan or other insanely spicy treats. It's just delicious candy with a bold blaze of cinnamon flavor that's tasty enough for Vat19 to take notice and offer to you.